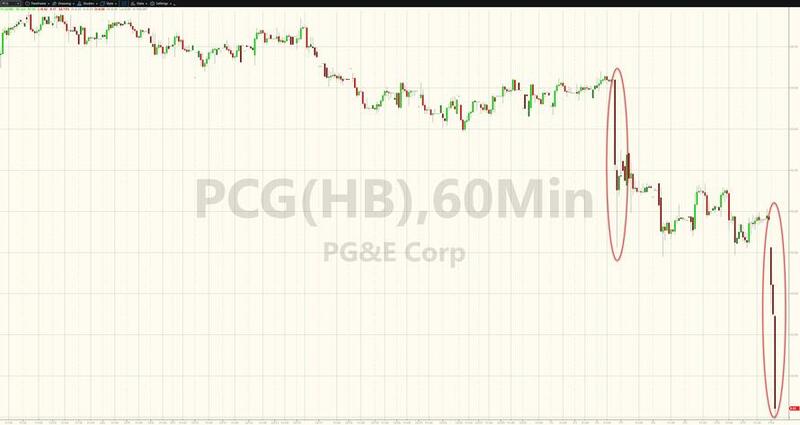 Shares of the troubled California utility PG&E tumbled more than 50% on Monday after its CEO Geisha Williams quit, followed by the revelation made in an 8-k filing on Monday morning that the utility - which is facing potentially billions of dollars in fines related to the California wildfires - is planning to file for bankruptcy on Jan. 29. PG&E has seen its shares plunge by more than half since November after the state opened an investigation into the utility's role in the wildfires. The utility had already participated in one of the largest bankruptcies in US history back in 2000 during California's energy crisis. Following a collateral-call-triggering downgrade to junk last week, rumors circulated that PG&E could inform its employees about bankruptcy plans as soon as Monday. Bond prices are plummeting further on the headlines also. The rout in PG&E shares have established the trade as the worst ever made by Stanley Klarman's Baupost Group. Williams, who was one of the first Hispanic CEOs in the Fortune 500, will be succeeded by the company's general counsel on an interim basis. Her departure follows the exits of three PG&E CEOs earlier this month, according to Bloomberg. "I will be leaving PG&E,” Williams said in a separate email, without providing a reason for her departure. "I value the opportunity I’ve had to lead PG&E and wish all of my colleagues well." Meanwhile, the possibility of a state takeover and/or state-organized breakup have also loomed over the company. Newly appointed California Governor Gavin Newsom said during a press conference Thursday that his office would be making an announcement related to PG&E within the next few days and that the issue was at the top of his agenda. He said in a later interview that the announcement would involve appointments to the California Public Utilities Commission, the state’s grid operator and to a commission established by legislature to explore wildfire issues. After taking the helm at PG&E, Williams pushed for changes to California laws to free utilities from responsibility if their equipment malfunctions and causes a natural disaster - something she decried as "bad public policy." 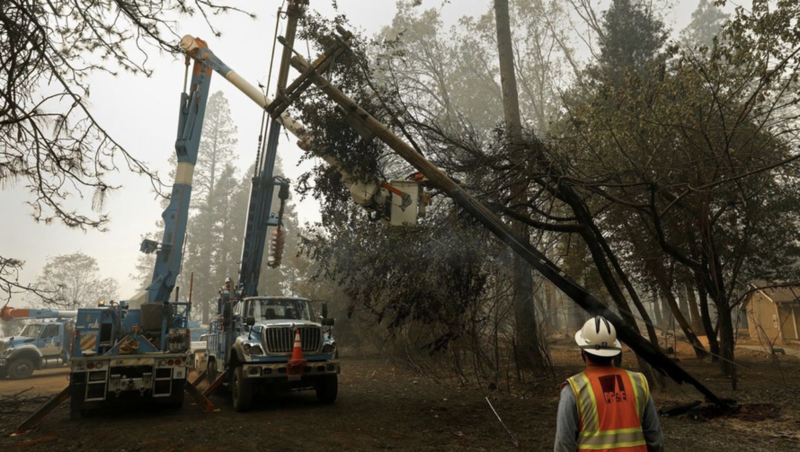 However, while lawmakers have rejected PG&E's calls to change wildfire liability laws, they did pass a law in August to help the utility to pay for the 2017 wine country fires. California lawmakers are now weighing whether to pass another law to help PG&E limit its liability. Then again, PG&E's planned bankruptcy filing could be a bluff to force California lawmakers to act. After all, if PG&E goes down, it would be shielded from bankruptcy-related lawsuits - while Californians might be faced with higher utility rates. So what happens next for bond holders? Pacific Gas & Electric became the biggest utility to go bust in April 2001, after running up about $9 billion in debt by buying power for more than it could charge customers under California’s electricity deregulation. The utility exited bankruptcy in April 2004 with a plan that made creditors whole, restored dividends to shareholders early the next year, and required California ratepayers to pick up nearly $8 billion in costs. As part of a June 2003 settlement with California Public Utilities Commission, PG&E created paper assets worth $2.21 billion that were eventually funded through the sale of bonds backed by ratepayers. 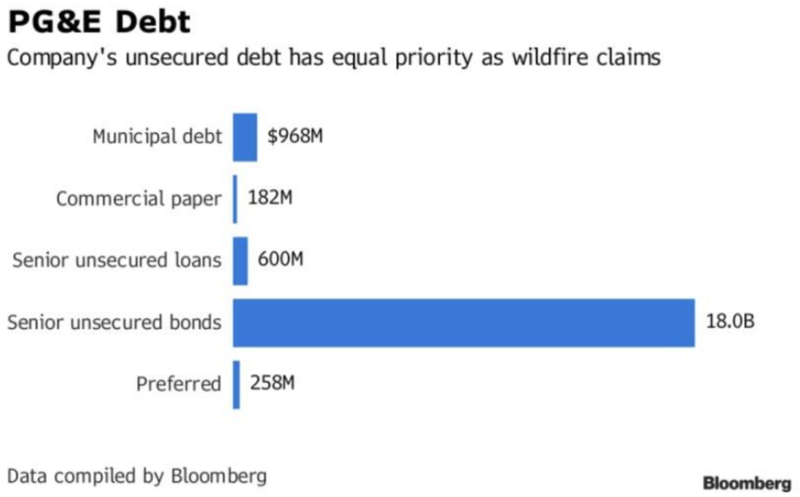 The deal allowed PG&E to show more equity on its books without constructing new facilities or making new investments until the company was steady enough to sell real debt. By the way, this wasn’t PG&E’s only experience with bankruptcy. National Energy & Gas Transmission went under in July 2003; PG&E previously owned 97 percent of its common stock, but all of that was canceled with the unit’s emergence from bankruptcy in 2004.